Who says the banks aren't lending? Today, the Mayor announced a £1 billion loan from the European Investment Bank to Transport for London. 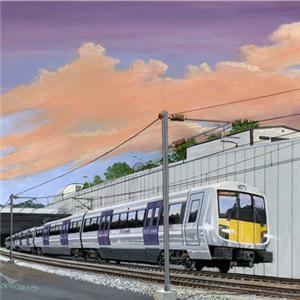 The fiscal fillip represents 40% of TfL's projected contribution to the Crossrail project, which will link Berkshire and Essex via a Central London rail route. It is, they say, one of the largest loans ever for a transport project. Yet we've still to find a news report with any kind of financial analysis, which seems a little tardy given that the press release went around yesterday. Instead, we get a roundup of super-enthusiastic quotes from those involved. It's a "billion more reasons to proceed with the unstoppable force that is Crossrail," flugelhorns the Mayor (he's too eloquent to trumpet). The loan "provides international recognition of Crossrail's importance," adds TfL, somewhat less brassily. And, we'd agree, it's wonderful to see another slab of funding in the bag for this much-needed project, especially given recent doubts over the government's contribution. But where are the pie charts and Pestonic break-downs to remind us of who's contributing what and when? What are the terms of the loan? Like, when do we have to start paying back, and can it be deferred if the project is delayed? If all goes well, the money will be returned via 'projected operating surpluses' analysts expect the line to make after it opens in (fingers crossed) 2017. Here's hoping.